Dependable containment for bamboo plantings protects valuable hardscapes and neighboring properties from damage. We offer bamboo barrier in multiple lengths and thicknesses to match your specific application. For light duty bamboo or invasive species control applications. For more than a decade thousands of our customers have installed 30 mil barrier to control bamboo and we have received very few reports of bamboo puncturing the barrier. Nevertheless, 60 mil bamboo barrier has been proven to contain the vast majority of bamboo species, therefore we officially recommend 60 mil barrier for most bamboo containment applications. For Medium Duty Bamboo Applications. Many types of bamboo are adequately contained with the use of rhizome barrier measuring 40 mil in material thickness. 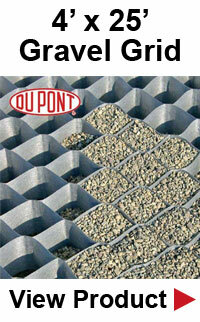 For ultra-heavy-duty bamboo containment applications. 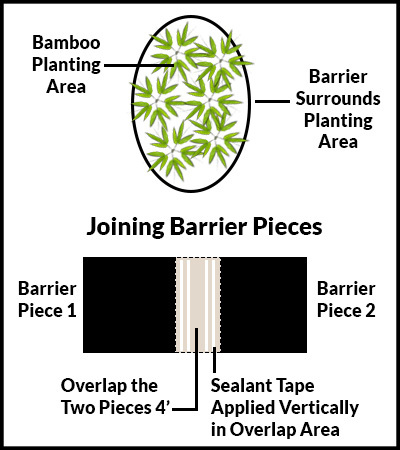 80 mil barrier is constructed of thick HPDE and provides containment for the most aggressive bamboo species and plant sizes. 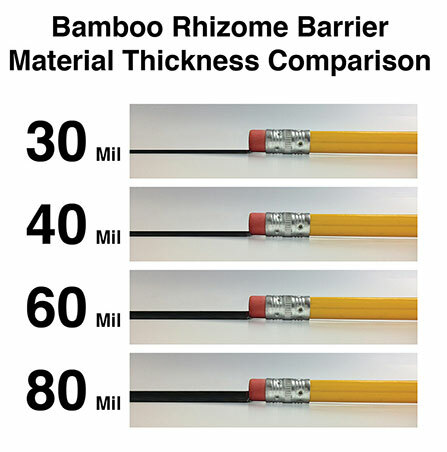 80 mil barrier is the thickest barrier available and is trusted on projects where bamboo overgrowth could result in significant property damage if not properly contained. About Bamboo: Bamboo plants are in the subfamily of flowering perennial evergreens. They are some of the fastest growing plants in the entire world, due to their rhizome-dependent root system. Some species can grow 3 feet within 24 hrs, which is approximately 1.5-inches per hour! Trimming the constantly growing roots (or rhizomes) is of the greatest importance for controlling the growth of these beautiful plants. Removing the cane and shoots, above ground will not, in any way, harm your plants. The growth of your bamboo actually takes place underground and these roots are what need to be addressed. One very popular technique is to dig a trench around the plant so its roots can be seen and clipped back before they invade and grow over the trench. This technique can be effective if the trench is deep enough and if you work in your garden on a daily basis. Bamboo grows very fast and can become out of control very quickly, even with someone who is meticulous and is on top of it. Unfortunately, a trench is not exactly an ideal appearance in landscaping, they're pretty ugly! Trenches can also create a serious hazard if they're deep. You could trip and fall, causing serious harm to yourself. A more effective alternative is to build a barrier for controlling the roots of this very fast developing plant. The barrier is very good at curbing the growth and spreading of bamboo within their areas. These barriers are made of high density polyethylene (HDPE) and usually measure between 18 to 48-inches in height. It's recommended that the thickness be around 60 mil in order to adequately stop the bamboo's roots (see further explanation below). For most normal applications, it's a good idea to have the barrier's height between 24 to 36-inches. The product is sold in 100 foot rolls and can be cut to a desired size, using a simple utility knife. You will have to dig near the bamboo to find out how deep the existing roots are extending into the ground. Once you've figure that out, you should choose a barrier that is approximately 12-inches deeper than the depth of the roots. In other words, if the bamboo plant's roots extend into the ground 18-inches, you should choose a 30-inch barrier. That's because, when you install the barrier, the roots will run downward in an attempt to go around the barrier. Even though the roots will more than likely head upward, there's still a chance they will head further underground. By allowing an extra 12-inches in depth, will provide a greater protection against the roots going under the barrier. Once you have determined the correct height of the barrier, you will need to dig a trench, around the bamboo area, at a depth of 2-inches less than the height of your barrier. In other words, if your barrier is 30-inches, the trench should be 28-inches. This will allow 2-inches of the material to stick out above the ground, forcing the bamboo roots to grow upward and jump over the barrier. Note: Bamboo roots are naturally inclined to “jump”. Once the roots start jumping, you will visibly see them and be able to cut them back to prevent further spreading. At this point, you need to cut the correct amount of material needed for the length of the trench, then place it in the trench. Make sure you overlap the material by 4-inches, at the seam, to form a complete circle. Use HDPE seam tape to securely join the two pieces together. How Thick Should The Barrier Be? Customers who are interested in planting bamboo usually want to know if they are easy to grow and how to contain them. They are real easy to grow and must be contained. There are some general guidelines to follow regarding the size of the barrier. It's strongly suggested that the size of barrier should be based on the specific type of bamboo you purchase. The general minimum barrier specs call for a 24-inch depth barrier that is 40 mil thick, although a 60 mil barrier by 30-inch is recommended for moderate to large sized plants to be safe. Just for the record, a mil is a thousandth of an inch. The unit mil is used to measure the thickness of paper, film and garbage bags. When you purchase garbage bags, they are sized by mils - “XYZ Bags are 5 mil thick”. Most garbage bags range from 3 to 5 mil in thickness. A better example is your typical credit card which is approximately 30 mil thick. Bamboo plants are very beautiful and make a soothing sound when it's windy. Bamboo can also provide a great deal of privacy from your neighbors. If you do not control and contain your new found leafy friends, you will have hopping mad neighbors when your plants start invading their yards. If bamboo is on your list for growing, you must install a barrier to keep growth at bay and keep your neighbors happy! Generally, bamboo barriers come in five different sizes ranging from 18 to 48-inches in depth and different thicknesses ranging from 30 to 80 mil. The 40 and 60 mil thicknesses are good for the average gardener's needs, for creating a privacy wall or for their overall beauty. The 80 mil thickness is ideal for situations where large bamboo plants threaten expensive hardscapes, home foundations or in commercial settings where the absolute thickest material available is necessary. The correct depth will depend on the type of bamboo you will be planting. Before purchasing bamboo, talk with knowledgeable people who are familiar with the different varieties and the climates they are best suited for. There are many varieties to choose from and have different depths of growth. If you are not handy at installing a barrier, hire a professional to do it for you. Once all is said and done, enjoy your bamboo, they truly are beautiful plants!